On Tuesday, U.S. 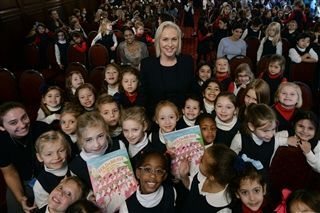 Senator Kirsten Gillibrand visited Marymount to share inspiring stories from her new children’s book, Bold and Brave, with students in Kindergarten - Class II. The book profiles ten suffragists, including Susan B. Anthony, Sojourner Truth, and Harriet Tubman, who fought to win women the right to vote. Students prepared for the assembly by examining suffrage and citizenship topics in their social studies curricula and asked Senator Gillibrand excellent questions about both the suffrage movement and her writing process. When she asked the girls what they would stand up for today, they offered a multitude of answers, including helping the homeless, taking care of animals, protecting the environment, and helping the children of Zimbabwe. After the assembly, each student received a signed copy of her book, which were generously donated by a Marymount family.